Since my earliest days there was something about the taste of lemon I always liked, ever since I’ve tried to include lemon as an ingredient wherever possible… and sometimes even where it was not always possible to make it work. In a large mixing bowl, add the flour, sugar, salt and lemon zest. Use a pastry blender to mix the dry ingredients. Next slice the margarine and parvecream cheese into 1″ slices and add it to the flour mixture. Use the pastry blender, or two knives in a scissor fashion, to combine the ingredients until mixture has the texture of a coarse meal.Next combine the water and the vanilla extract and sprinkle it over the flour mixture. Using two forks pull the flour from the bottom up over the top. Then with your hands, gently begin kneading the dough to form a ball. Wrap the ball in plastic wrap and store it in the refrigerator for 30 minutes (or freeze it for up to one month).Finally preheat the oven to 375F. When you’re ready to use the dough, roll it out on a floured surface and place it in 6 to 8 mini tart pans (or one 9-inch tart pan). Add some pie weights or dried beans to the tart pans and bake the shells for 10 minutes. Then carefully remove the weights and return the shells to the oven for another 5 to 10 more minutes, or until golden brown. 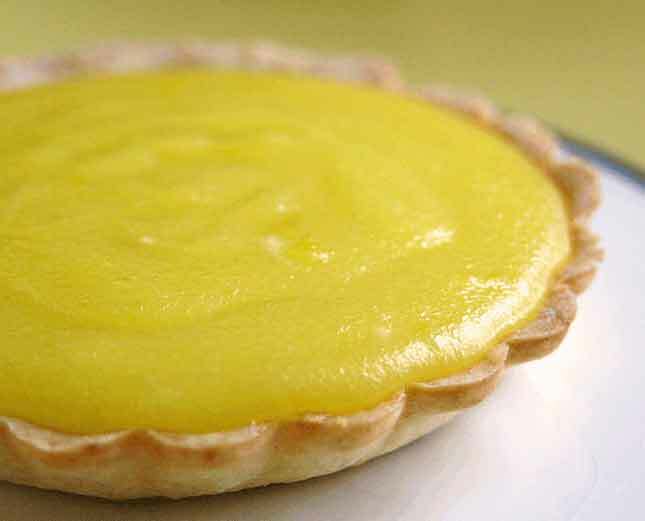 Remove and set aside to cool completely.While the tart shell is baking, prepare the filling. Carefully remove the peel from one lemon. Cut the peel down so that it?s paper thin and slightly translucent. Then using a sharp knife mince the lemon peel. The peel of one lemon makes approximately one tablespoon.Add the minced lemon peel, sugar and eggs to a small sauce pan and whisk together. Stir in the lemon juice and then add the butter in pieces. Cook over medium heat until the butter melts and the mixture simmers. Do not let the mixture boil.Once the butter is melted, reduce the heat to a simmer and stir constantly until the mixture thickens (5 to 7 minutes). Finally remove from heat, cover and let cool, stirring occasionally. When the tart shell has cooled and the lemon filling has cooled. Pour the filling into the mini tart shells, using approximately 1/3 cup per tart. Refrigerate the tarts for at least an hour. Serve chilled or at room temperature.